As we move toward the end of the year, it can mean only one thing: it's time for a new game with everyone's favorite virtual idol, Hatsune Miku. Project Diva f, this year's iteration in the series, is filled with firsts. There are new game mechanics, new songs, new costumes, and a from-the-ground-up graphical revamp as the series moves from the PSP to the Vita. But have all these changes come together to make a better Project Diva game? Or are long-time players going to find themselves wishing for a return to the good old days on their PSPs? While Project Diva f has less songs overall than last year's Project Diva Extend, each and every one of these songs is completely new to the Project Diva series. For the most part, all 32 of the songs are solid and range from slow ballads to pop hits—and I liked personally Project Diva f's set list far more than the one in Project Diva Extend. Best of all, though, is the inclusion of one of the greatest meme songs of all time, the Nyaan Cat song. So while your favorites may have gone away, you will no doubt find some new ones here. that the series is on the Vita, the character models are more detailed than ever before. So instead of just unlocking new costumes for each character, you also unlock a myriad of extra costume pieces like hats, glasses, and kitty tails. And while costumes and accessories are a bit more expensive in this iteration, you'll be replaying levels over and over just to see the costumes in action. game requires high-speed flicking, it becomes more and more difficult to judge the correct timing for your flick. Adding insult to injury, the majority of star prompts come in the new "technical zones" of songs where breaking a combo denies you a large chunk of bonus points. So while the touch controls don't really break the game, they don't add anything either—other than some occasional frustration. So while the touch controls can be annoying, they are far from the worst addition to the game—that would be the menu interface. There is quite a bit of loading in Project Diva f, and it's made worse by how many menus you need to go through to get anything done. Unlike in the last game where there was a special option in the main menu for adjusting the characters' costumes, you must now equip the costume and accessories you want before each and every song (if you don't want the default costume, of course). This process, when including the loading times, takes a good half minute time whenever you change a costume. 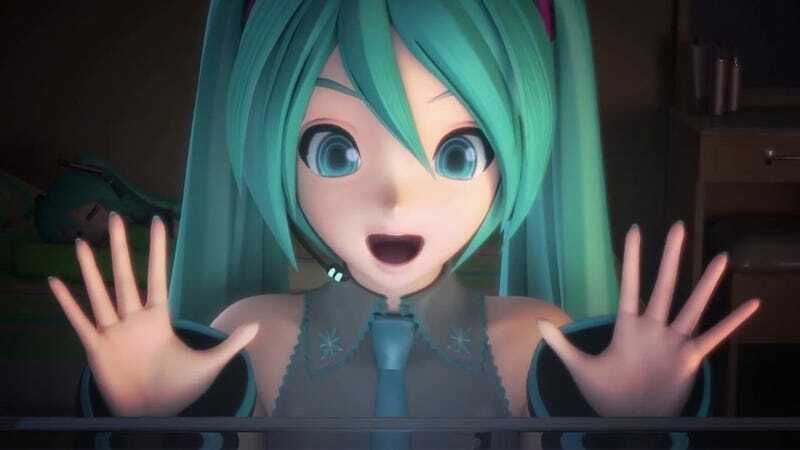 And even if you only wish to see which costumes and accessories you've already purchased, you have to leave the store and enter Miku's room or work your way to the costume select screen that appears right before the song. None of this is hard to do, it just wastes so much of your time with the constant loading that you'll wonder if the costumes are worth changing at all. Project Diva f is a solid title in the Project Diva series. While it makes some mistakes, these can be forgiven as it also takes some chances—keeping the series from becoming nothing but a new track list each time a new iteration is released. The songs themselves are quite good and the costumes and music videos are amazing. And all the goodies, like the edit mode and Miku's room, return as well. So if your Vita is craving for a new music title, there are far worse games you could feed it than Project Diva f.
Hatsune Miku: Project Diva f was released on August 30, 2012, for the PlayStation Vita in Japan. It is also scheduled for a PS3 release early next year.